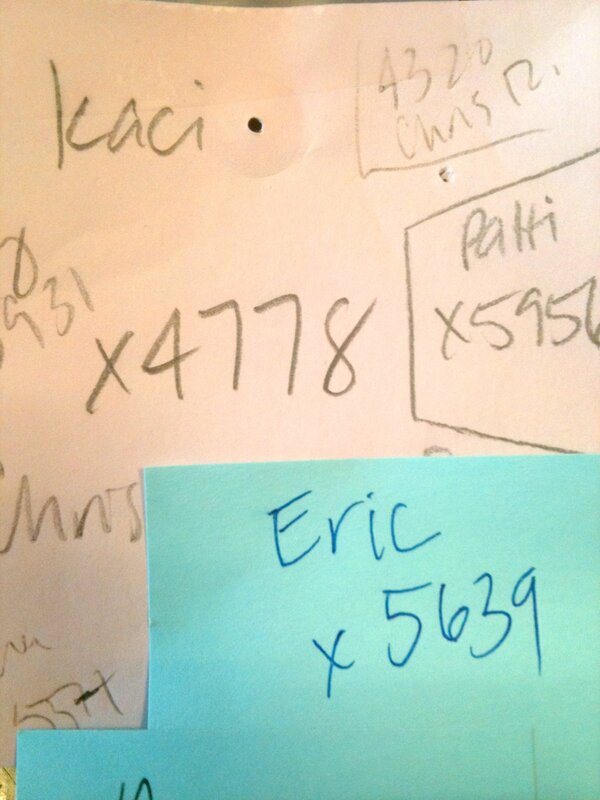 Yes, the extension list of my co-workers that I keep at my desk is rather… haphazard. The pink Post-it has notes that are years old; the blue was written just a few weeks ago. This week I was cleaning my desk at work and trying to corral the herd of Post-it Notes that had spread all over it. I started to pile the notes together, and that’s when I noticed my handwriting. I was surprised and elated to see that the names and extensions on notes I had written before my surgery looked just like the ones I had written last week! Normally, cleaning off my desk is a sober chore, since besides notes, I have many folders I use and re-use, most with handwritten labels from either before my surgery, or from right after it, or from the present. 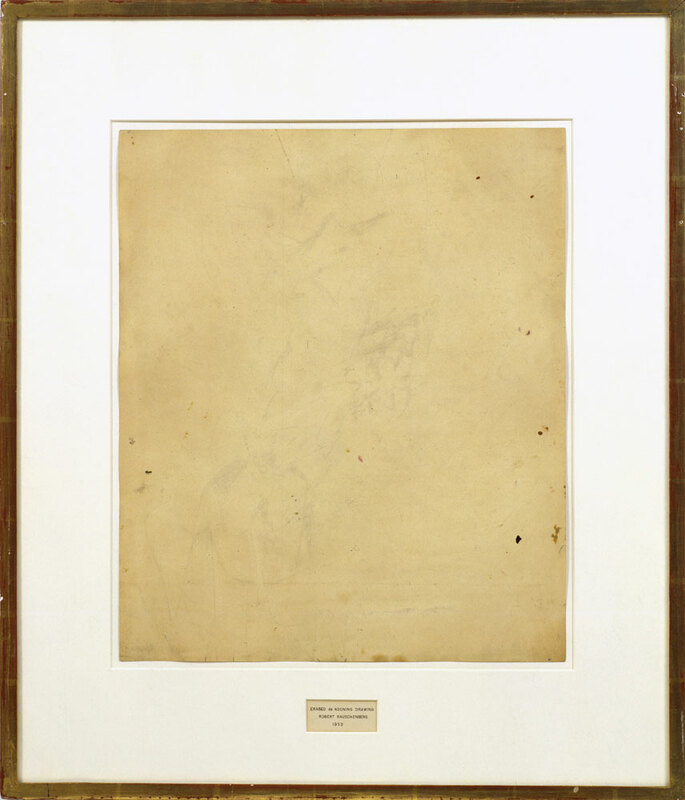 The result is that I have many visual reminders of how the handwriting I worked so hard at–tried so hard to make into a reflection of me and my personality–deteriorated after my surgery. Back during my days at rehab, I told my occupational therapist about my difficulty writing and, as a result, my handwriting despair. She told me not to worry; it would come back. And every month or so she’d ask, “Is is back yet?” with expectation and hope. But it never happened while I worked with her. It took more time than that. But now–finally! Four and a half years after my brain surgery and my handwriting looks like its old self! Hooray! Now, if you think it’s silly or strange for me to care about my handwriting returning to its former look, I don’t blame you. After learning to walk, talk, and feed myself again, I should be content and not worry what my writing looks like. Right? But sometimes it’s the little things that matter a lot, and I’ve chosen to enjoy this small victory for a while. It makes me hopeful. And happy. And it renews my faith in being patient. Seeing some great examples of street art recently inspired me to work in my "Walls" notebook again. 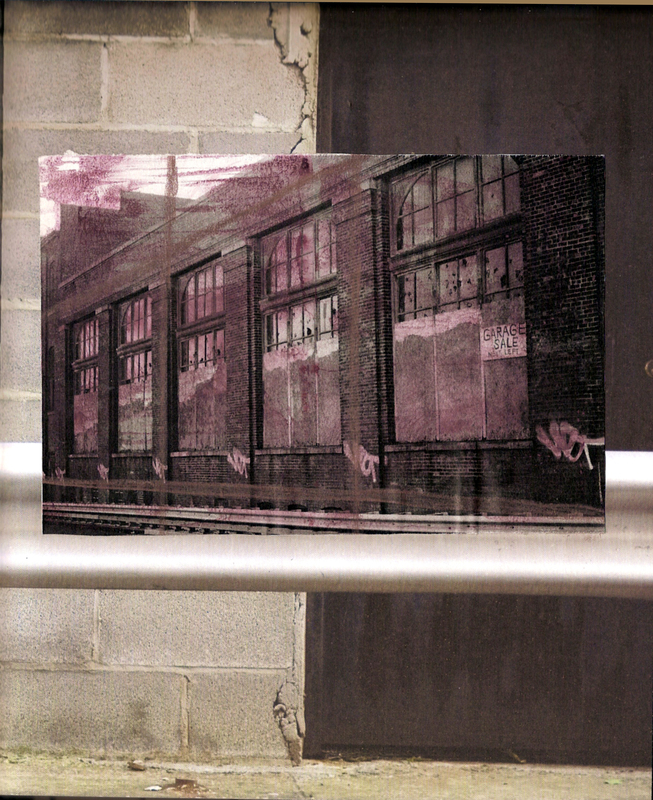 I took the photograph in this collage about 8 years ago somewhere arond Hoboken or Jersey City. A journal page from last week. The artist and frame maker Robert Kulicke once said, “A painting is finished when you agree with it, no matter if it took one hour or four months.” And the older I get, the more I see the truth in that–and the more I realize what patience it sometimes takes to get to the point of agreement. Back when I was in college, an old boyfriend first introduced me to this idea. I was taking an Introduction to Photography class and was frustrated that a recent contact sheet showed no potential. I didn’t like anything I saw, but I couldn’t explain why. “Put it away for six months and look at it again. I bet you’ll like it better,” he told me. I should have listened–he was a much more experienced photographer than I was–but I just grumbled about how that didn’t help me finish my current project. Years later I found that contact sheet and wondered why I had hated it so much. Now I often go back to collages or journal pages that I was never totally happy with–ones that are months or even years old–to see if I can find a way to agree with them. I sometimes find that although I was stuck before, I now have enough experience to get past whatever was stopping me. I see right away what I need to do to “fix” the piece. Other times I need to have enough distance from my initial expectations so that what I once stubbornly considered “wrong” becomes something that doesn’t have to be fixed at all. And then there are the times when I realize that the piece will never be something I can agree with. Then I paint over it without any regrets. 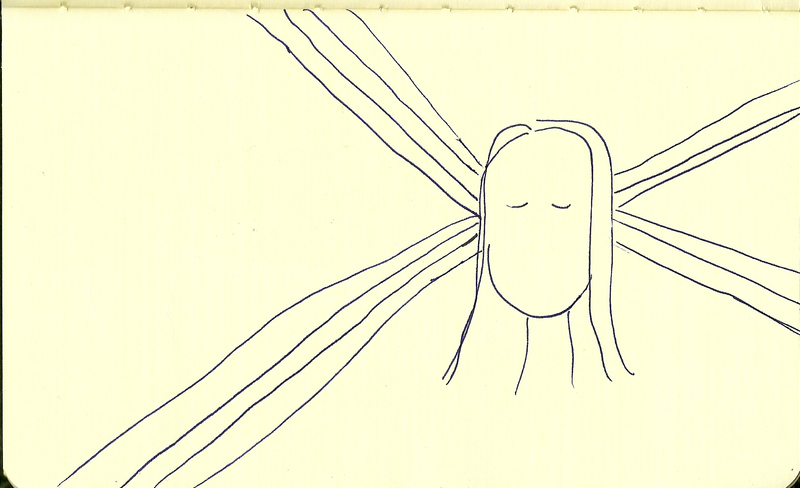 I clear my head and start over. That’s one of the reason why I keep a handful of journals going at the same time. If one frustrates, me I can easily move to another. This keeps me from getting too anxious while I wait to realize what the “disagreement” is really about. And every once in a while, I work on a page when just a few lines or three torn pieces result in a collage or journal page that seems “done.” I realize that, at times, agreement comes quickly and easily, without waiting. I started this drawing two months ago. I am not in agreement with it yet--abstracts are especially hard for me to finish! Keeping the pencil, pen, or paintbrush in motion is key. Something quick and simple I did last week. 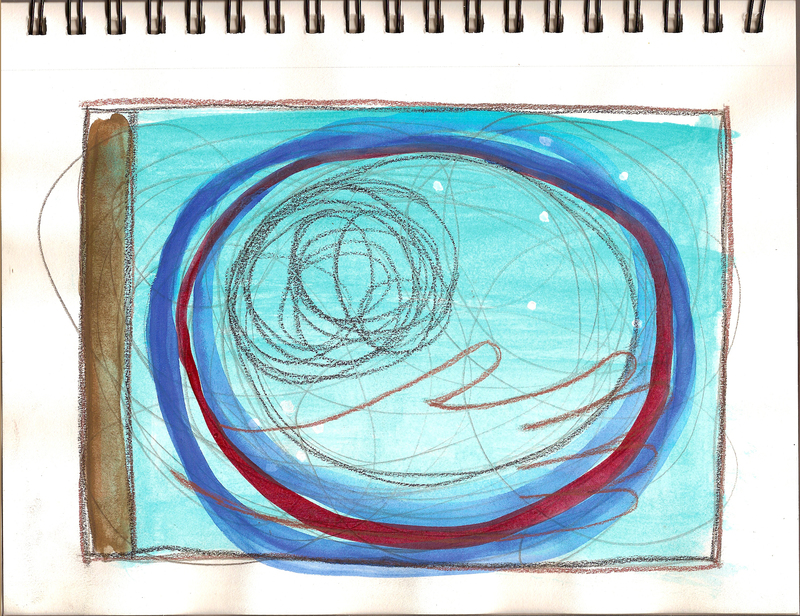 That little black voice is at it again–you know, the one that asks, “Who do you think you are?” and “What do you think you’re doing?” every time I sit down with my art journal. Yeah, that one. After all, it reminds me: you’ve never been to a drawing class; you haven’t paid your dues at an art school; you’ve had brain surgery and now your right hand is messed up; you have few technical skills; and also, the boys probably need a snack so you should put your pencil down and go be a good mom. For now, my answer comes from the introductory pages of the Drawing Projects book I just started, which defines drawings as a record in marks of your emotional response to the situation. I love this definition. It doesn’t say that your drawing has to look a certain way or show a certain level of ability. It doesn’t say that if you aren’t good enough, you are disqualified. It says all you need to be able to do is feel and then want to translate that to a page. And that, I can do. Besides, doing it keeps the voice quiet. Inspiration can come from anywhere out there! 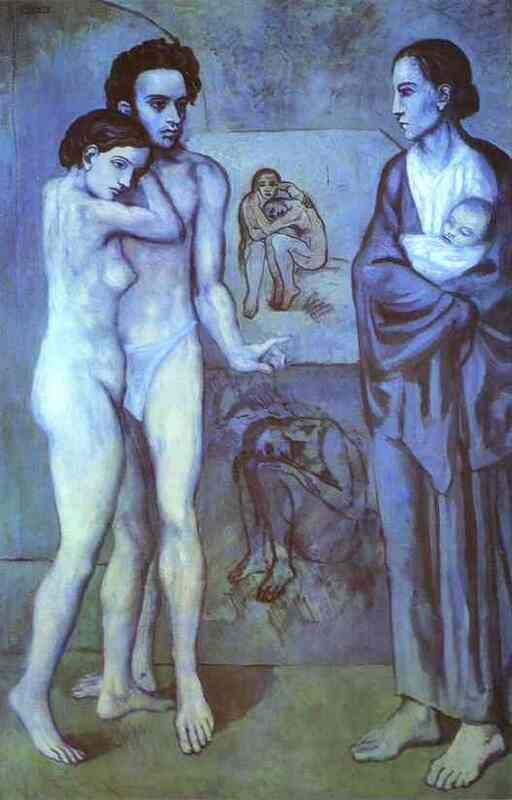 I love this Picasso piece because I don’t fully understand it. What are those paintings inside the painting? Who are the people shown? Only Picasso knows for sure, and we are left feeling that he has developed a visual vocabulary that speaks in a language only he understands. 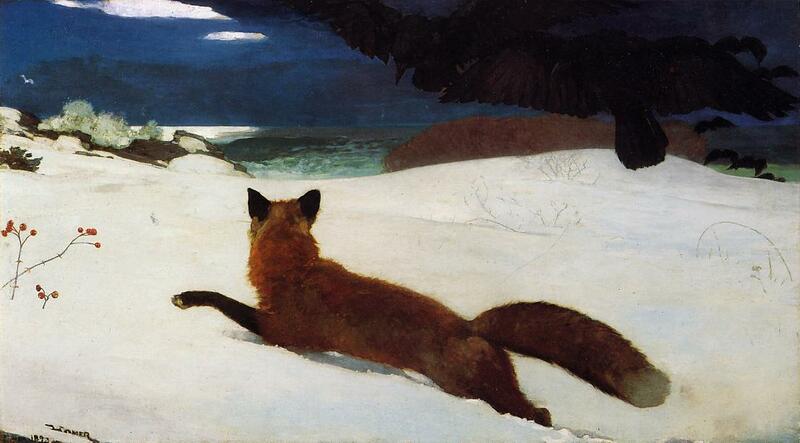 The fox–how I have felt like that fox at times! Homer has too. I think that’s why his signature is at the same angle. 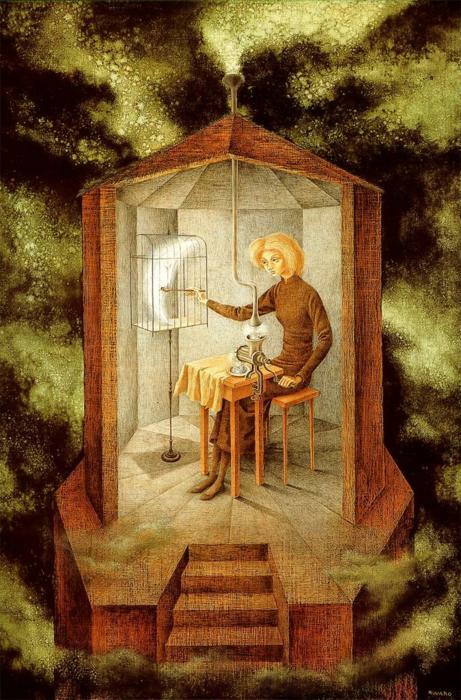 Remedios Varo is one of my favorite artists for many reasons. This painting turns a simple domestic action into something surreal by its setting. I am fascinated. 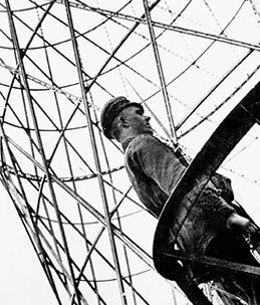 There are so many photographs of Rodchenko’s that I love! This is the one that introduced me to his work, which emhasizes shapes and forms, and yet somehow captures emotion, too. It makes me wonder if those Soviet Constuctivists were on to something. 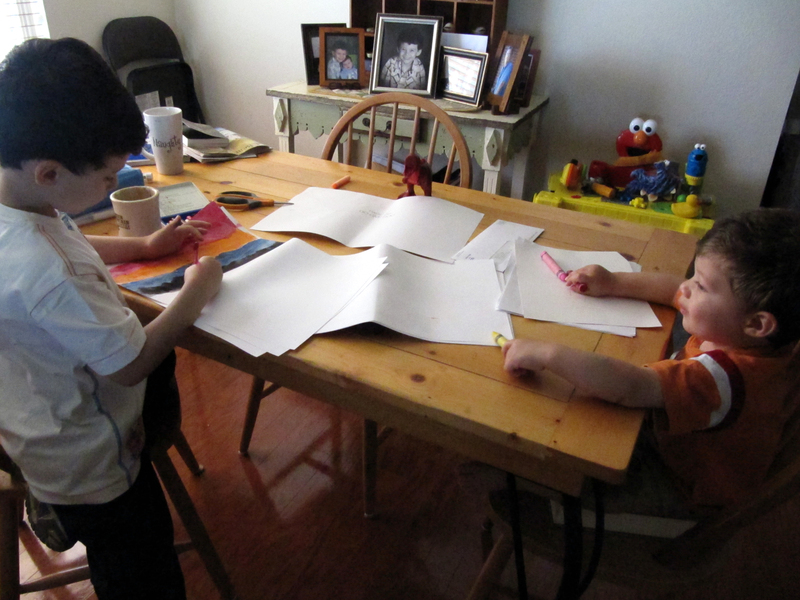 From a Saturday morning about a year ago: the boys making art at the kitchen table. Not long after my brain surgery, I wanted to get back to making collages and working in my art journals. In fact, I wanted to start as soon as I got home from the hospital, but that just wasn’t possible. I had lost too much control and coordination in my hands. Once I started occupational therapy, however, I found ways to work within my limits. Some were simple strategies: like using punches to cut paper into shapes instead of scissors, which I couldn’t hold. Others were more unexpected and a bit child-like. That child was my son, Antonio. 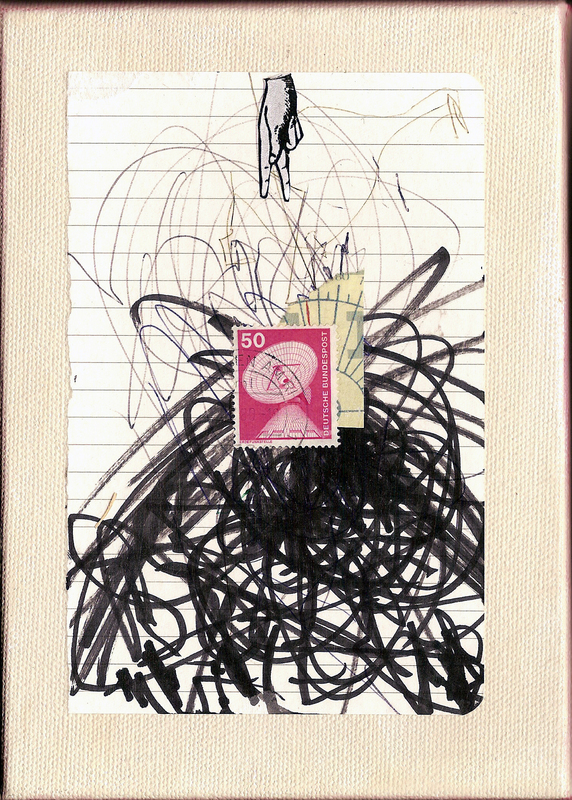 He was just about two years old at the time, and he loved to mark up any paper he got his hands on with pen, or crayon, or marker. 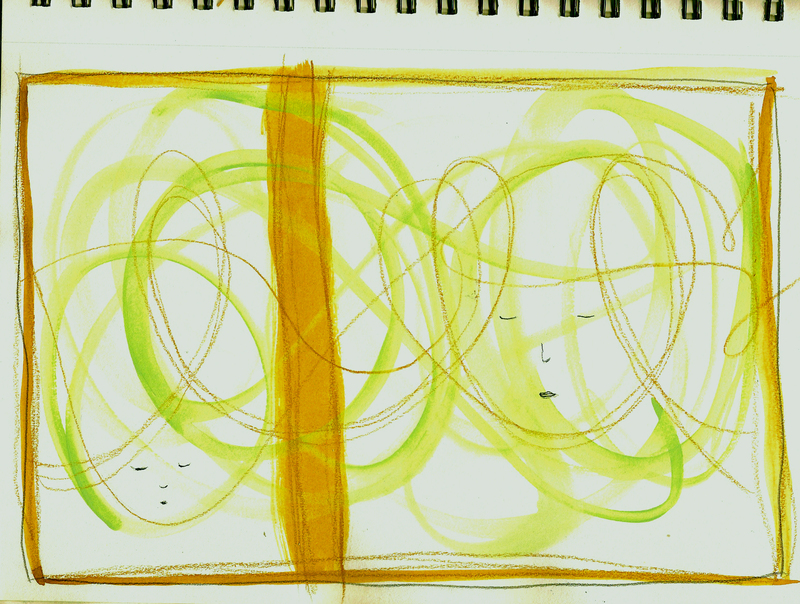 And in his scribbles and scrawls, I found a replacement for the painted backgrounds I could no longer create. That was four years ago, and now I am able to paint backgrounds, draw simple lines, and even use scissors. But I still use Antonio’s artwork in my journals from time to time, and now his younger brother, Adan, also paints and draws on papers that I use. 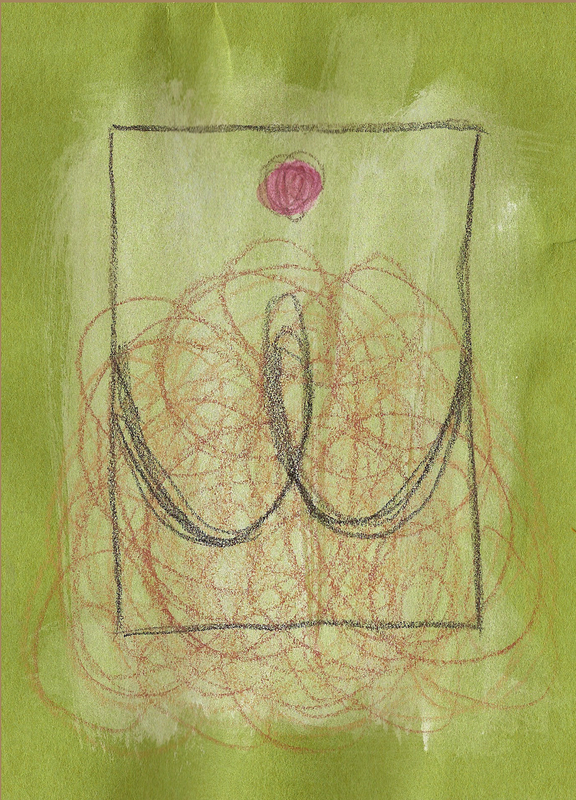 Both of the boys create with a combination of complete abandon of expectations and raw energy, and I love to add their spontaneity to my work. Here are the real abstract expressionists! When I was beginning to learn to adjust to my “new self” after the surgery, I was hyper-critical of all I did–or could not do. I compared everything to what or how I did things “before.” Sometimes I still do. It is the boys’ lack of self-criticism while working that reminds me that making art doesn’t have to be something you are good or bad at, it’s just something you do. In so many ways, it is my boys who remind me that today is the day that matters most. Background from this collage by Antonio, thanks to a long wait at the doctor's office. Now I live in the DFW area, but on September 11, 2001, I was living in northern New Jersey. 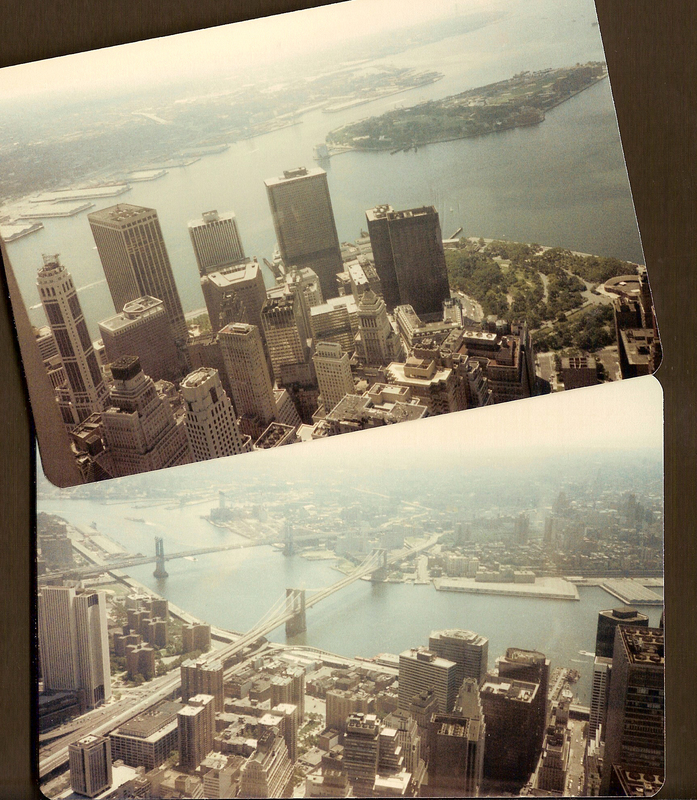 And everyone I knew was directly affected by the attacks on the World Trade Center that day. So many memories. I was still dazed; I could hardly accept what happened. And she was talking about art. Later, I thought I understood. Sometimes making art is what we need to work though a situation that is difficult, or even impossible, to understand. We paint or draw or cut and paste; and while our hands move, wheels in our brains turn, too; and hopefully wind themselves up to a better place. Other times it is a way to reach out to others. 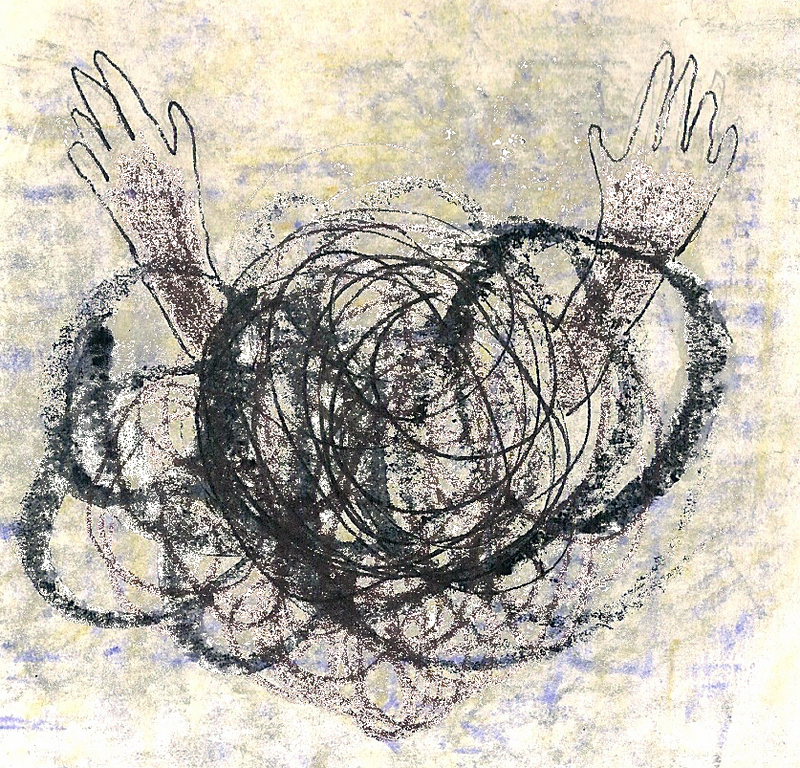 When we seek human connection to assuage fears and confusion, we offer whatever we have. Now I know these things. The other day I was visiting a friend’s house when I caught a glimpse of a book on her shelf. It turned out to be the book that accompanied Tim Burton’s recent retrospective at MoMA, and I was enthralled by the sketches and drawings it showed. And while I perused those pages, I realized that I haven’t been to a museum lately. Neither have I purchased any art books. That’s not a good thing! So what else could I do but head to the bookstore the next day? (It was too late to arrange a trip to a museum that weekend.) At at store I found at least 10 books I wanted; to stay within my budget, I carefully choose three and went home to indulge. 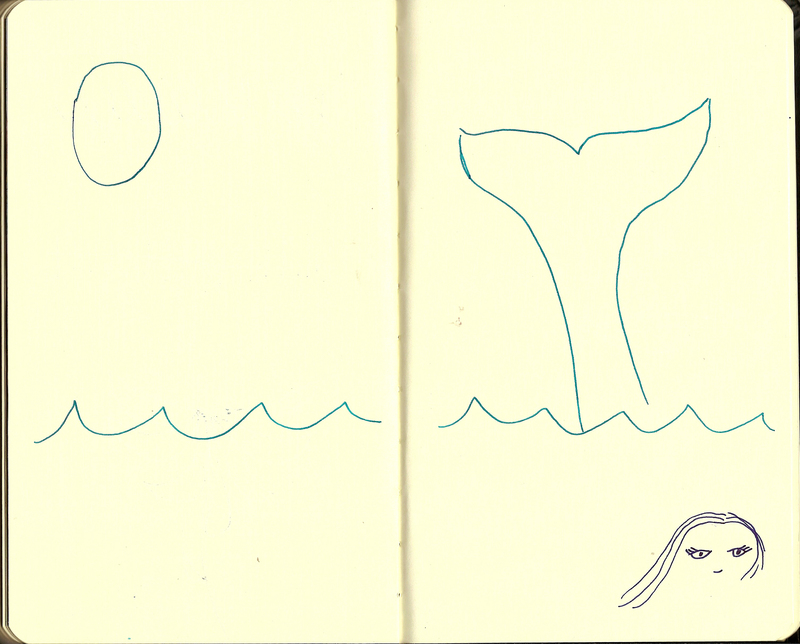 I wish I could tell you that these books will improve my art skills. But I do find a good book inspiring, and after reading just a few pages of the first one, I felt the urge to pick up my pen and get to work. I felt newly connected to the world of art and those who make it. Just wait until I get to a museum! P.S. 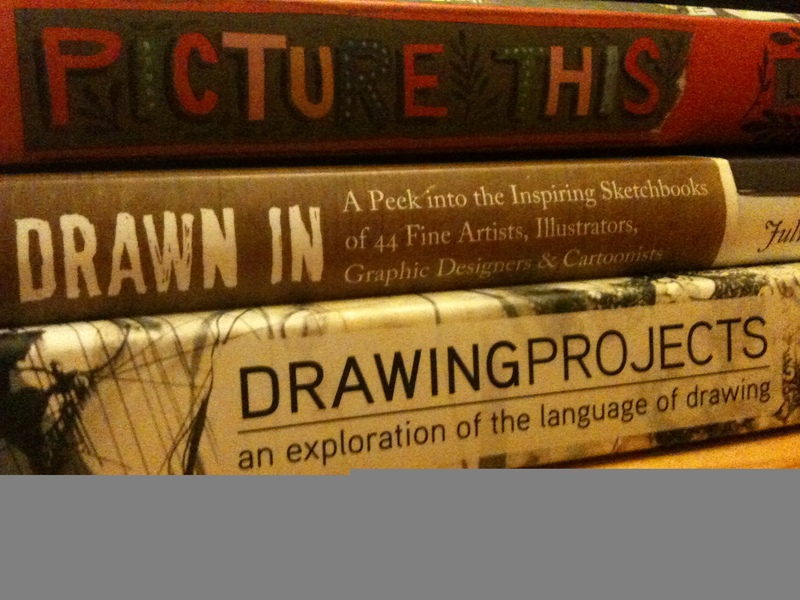 If you have any “art-y” books that you love and think I should know about–leave a comment! I have an amazon.com gift certificate to use!